Going up the twelve flights of stairs that lead to the highest point of the castle of Rivoli, until July 13th, we arrive in the world of the ideas of photography. A place where not only the thought and the project of the picture precede the shooting, but where the subject itself is a pretext for a conceptual reflection on the world. The title of the exhibition “Another Photography” tells us that capturing the moment or a perfectly photogenic image is not what Jan Dibbets is interested in. 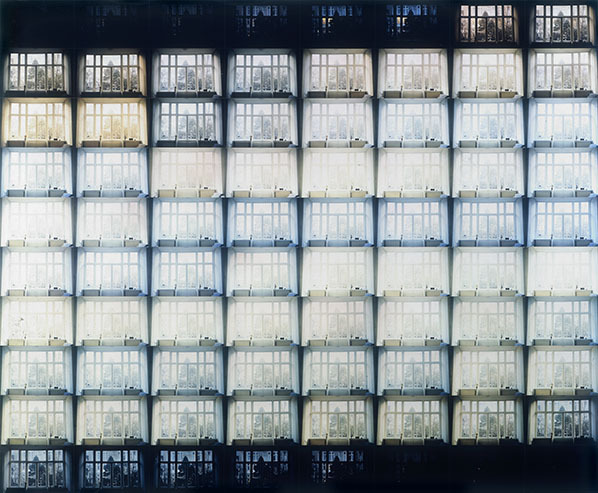 Dibbet’s photography does not try to represent what is physically seen, as a media of the physical object, but how we see, making us reflect on the various aspects that regulate our perception of the world. The goal might be to test our beliefs, but, ultimately, the effect is to expand the depth with which we relate with the world thanks to the increased awareness that this experience generates. If in painting perspective has been an achievement, in photography it is a fact that often goes unnoticed. 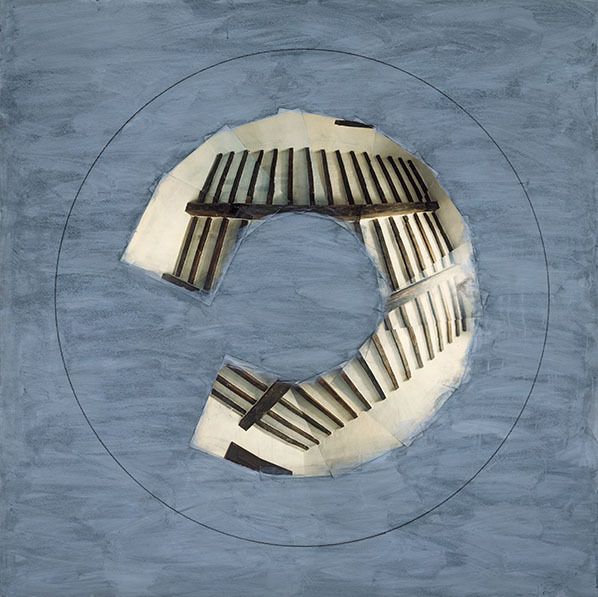 To show it Dibbets designs in his early works of the late ’60s a distortion of the subject being photographed in order to represent its ideal form on the film. 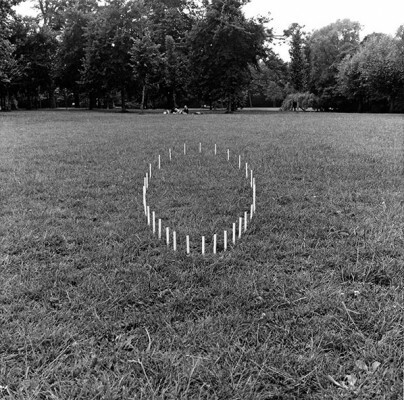 In “Perspective Correction – Circle of Poles without Rope”, 1969, we see small evenly spaced poles embedded in the ground to form a circle and we understand from the project that on the ground it has been traced an ellipse and that the distances between the poles are specific. 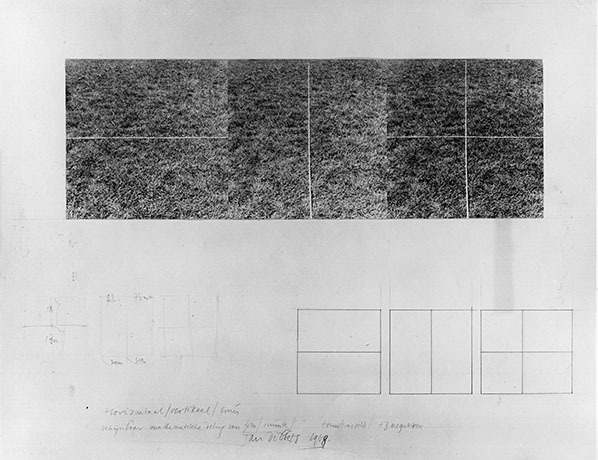 “Perspective Correction – square in grass, Vancouver”, 1969, is even more surprising: Dibbets digs into the grassy land a geometric shape that we perceive as a square. 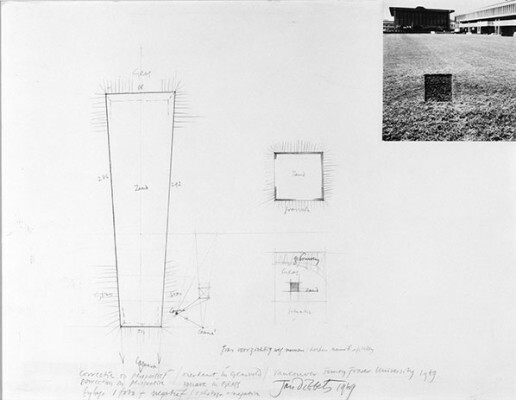 From the pictures alone, without looking at the project, we would not be able to understand that a big trapeze was physically dug. 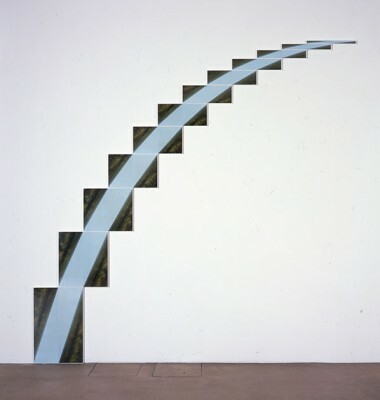 In “Perspective correction – Horizontal, vertical, cross”, 1968, the artist presents the limit case: the vertical central line and the horizontal ones in the image are not distorted by perspective. Connected to perspective, as the place of vanishing points and stable reference of the vision, is the horizon. Dibbets takes as subject the landscape of Holland, his homeland, without any geometric object in the foreground to interfere. The line of separation varies, according to the study, in all combinations of sky, sea and land. In “Horizon – Sea”, 1971, the artist experiments ten heights of the horizon with a variable proportion between sea and sky. This process continues with other studies as “Sea – Horizon 0°- 135°”, 1972. Finally, in the dual-channel video “Horizon III – Sea”, 1971, the horizon completely loses all its characteristics: it is at variable height, mobile, tilted and, because of the two videos, it is not even unique: we have no longer any doubts on what the horizon is. 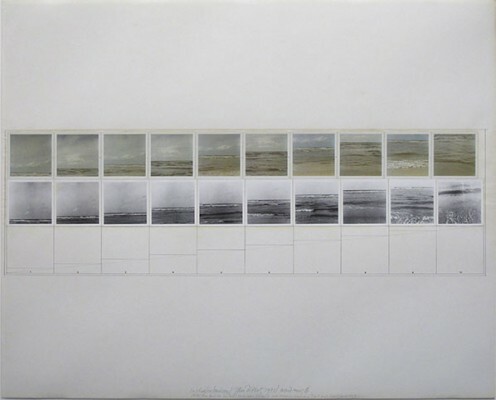 When the horizon loses its meaning of stillness, the different two colors images of sky-sea / sea-land / sky-land become for the artist an alphabet with which to build, through collage, images of surreal worlds in which, for example, you can see the Dutch mountains in “Double Dutch Mountain -Sea”, 1971, eventualy achieving a complete abstraction in “Comet Land / Sky / Land 6 ° – 72 °”, 1973. 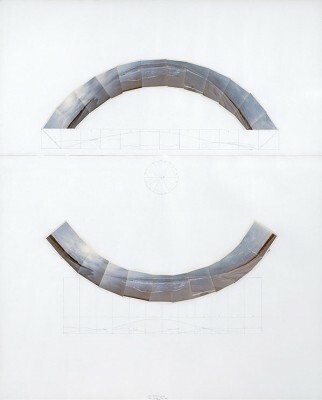 The photo collage along an arc, in the case of the horizon, had begun to convey the idea that the world of the observer was not infinite, but had limits. These limits increase and create the shape of an isolated planet in the works of the ’80s. These mostly portray the boundary-surfaces of closed places: ceilings and floors. The series of photographs mounted on a monochrome board, compose the image with a process that is similar to what we do when we rotate the head to seize the subsequent parts of a subject. The image is never completely closed and from “Self-portrait as Photographer” we assume that the photographer occupies the open space: The empty central part corresponds to the shape of a head. In this area sometimes Dibbets traces a few pencil lines that continue the geometry of the subject; it is not an exhaustive operation, but an incentive to the viewer to complete the image. Moreover, much of what we see depends on us and not on the subject and, perhaps, that empty space in the photo is the place of the viewer. 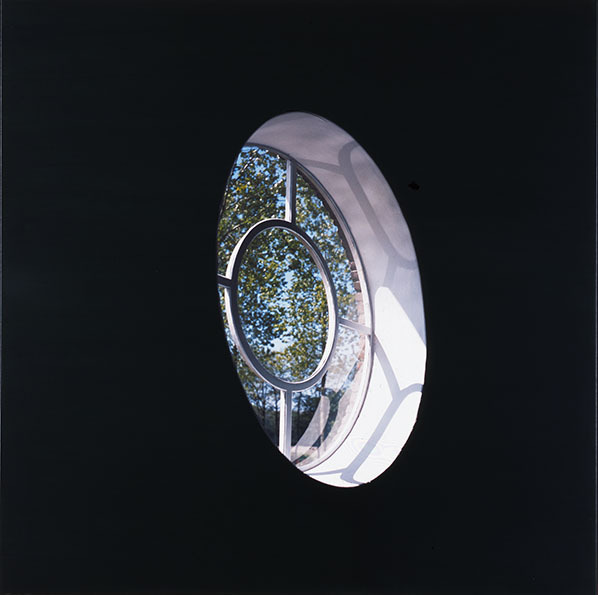 The photographs of the ’90s portray those kinds of windows that in architecture are called “oculi”. 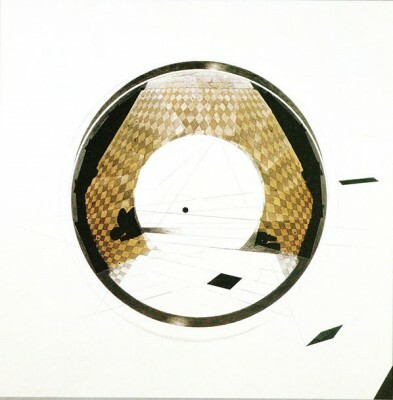 From a dualism exterior / interior of the building, one quickly comes to the metaphor in which the eye becomes threshold between the world and the mind. Light is the vey essence of photography. If from a single static frame it may go unnoticed, making a series of photographs at regular intervals with the same framing makes the concept evident. 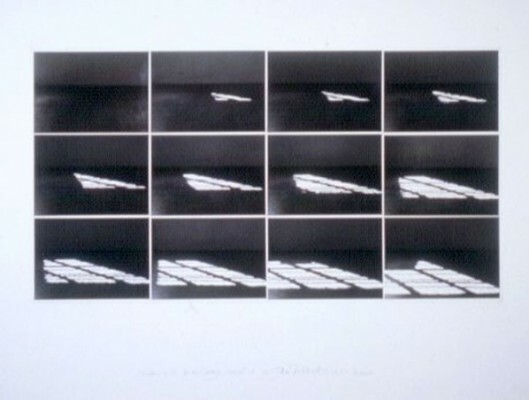 In “The shortest day at my house in Amsterdam”, 1970, the subject is the continuously different light of the winter solstice. In “Shadows on the Floor of the Sperone Gallery”, 1971, the variable projection of light and shadows makes the passing of time noticeable. Again, the subject is a concept; moreover, for Dibbets “a photograph does not produce an image, it records variations of light”. The photograph-icon of the exhibition is a red monochrome. 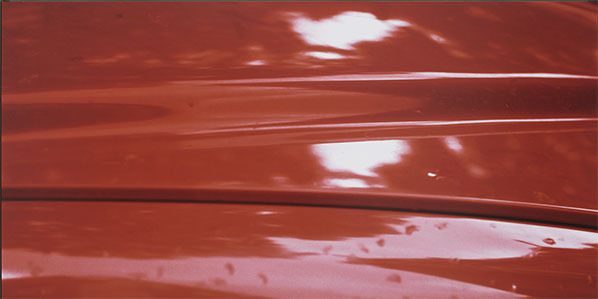 In fact, the body of the car photographed in 1976, restudied and reprinted magnified in 2013, due to the glossy and not flat surface contains many reds with shades ranging from black to white, saturation points of the photographic medium, and is therefore only ideally monochromatic. Continuing in the same room we find similar images of other colors; with a minimum of attention, we realize that the base image is the same and that only color changes. The color, property of the object, now digitized, has become a measurable dimension, modifiable and re-synthesizable. We are no longer certain that the original photo is red, because it could be yellow, green, blue, black or silver, but this does not matter: in the world of ideas, thinking and being are the same thing.